the following reported issue has been resolved at 1:10pm 31 Aug 2012We are currently addressing a problem where agent details that are updated are not exported to all websites, we should have it resolved shortly. As you know the OMS can track property mandate changes and keeps a record of every mandate change. The mandate history dropdown have been enhanced to provide more valuable feedback as follows:- The date shown will now reflect the date the status was changed- It will show the number of days the mandate was in that particular statusIn the example below you will for example see that the mandate was 1st created on 21 January and remained in for sale status for 57 days before being changed to a pending sale on the 19 March:The example above also shows (via the pie chart) that there are 124 days left on this mandate to sell this property, roughly 50% of the mandate time passed. We have also renamed 'username' to 'email'. The property mandate screen has been updated to reflect the commission nett and gross amounts in a simple table format (and still with the auto-calculation features). We have also updated the days on market/days to expiry indicator to a little pie chart, the green slice showing the % of days left you have available on this mandate:Various upgrades will be done in the OMS for the remainder of the year to integrate & upgrade sales tracking & reporting functionality. If you have any suggestions, please capture them here online. As announced today on our Facebook page, we are almost ready to go live with the new Bid-or-Buy interface.This will seamlessly interface your property listings from the Office Management System (OMS) to the www.bidorbuy.co.za website. Pricing will be announced early next week.We have structured x2 packages and will also launch a competition, so watch this spot!Bid-or-buy receives over 1.2M unique visitors per month through their website and can therefore provide you with more exposure to your property mandates.The new Bid-or-Buy interface follows on an improved Property24 interface just launched. An upgraded Private Property interface is also underway while an interface to OLX is currently being developed. More exposure for your listings through the OMS. We’ve been hard at work lately extending the features of the OMS to provide a more comprehensive service. Launching soon is a range of automated and integrated property reports in partnership with Lightstone.You will be able to conveniently draw PDF property valuation reports in the OMS (Office Management System) branded with your company logo. Best of all is that you will be able to save these reports in the OMS cloud.Pricing will be announced closer to launch but you are looking at less than R50 for the property report than includes an automated valuation and less than R35 for the property report without the valuation. Other reports including suburb analysis, deeds name and property reports plus transfers reports will also be released. A couple of days earlier we’ve made this change that prevents the listing date to be changed to a future date. Unfortunately this update also crept into the rental listing mandates – we’ve now removed it and you can set the ‘available from’ and ‘available to’ dates correctly. At Entegral, we are obsessed about providing highly optimised systems and websites. Today we’ve made more adjustments to make your online OMS experience and visitors searching on your real estate website even faster!This includes the implementation of ground-breaking new cloud technology that allows for much faster access to your data, whether you are uploading or viewing your properties, viewing your contacts or searching on your website. Everything is off course based on our industry first and leading real estate cloud platform. It uses less energy and we only consume the immediate computing resources we require. Green IT for your real estate business.“Technical jargon to follow” warning!Based on IOPS performance measurements, it results in up to x10 faster read/writes to the Microsoft SQL Server databases hosting your data, when compared to the dedicated servers. This is especially useful at peak times ensuring consistent performance 24/7! WE’VE NAILED THIS SMALL BUG POSTED THIS MORNING – EVERYTHING BACK TO NORMALWe’ve made some performance upgrades last night but it looks like a small bug crept it. When you upload photos this message will appear after uploading:But don’t worry – your photos actually uploaded! Just go back to the property listing and refresh the photos pages, you will notice the photos are there.We will have this bug squashed in no time! Sorry for the inconvenience! 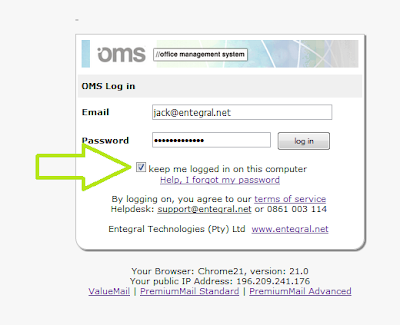 We are busy working on a new property syndication interface to www.olx.co.za, watch this space for the launch date. OLX is a popular classifieds website and does regular ad spots on tv to promote their website.We are also working on an improved user configuration which will launch in the next few days:If you haven’t yet tried it out, you can now send faxes straight into the OMS! Click here for more details on the fax-to-document library service. It is free and you can try it out immediately.The space provided in the document library has also been doubled, so you can securely save all your faxes online.